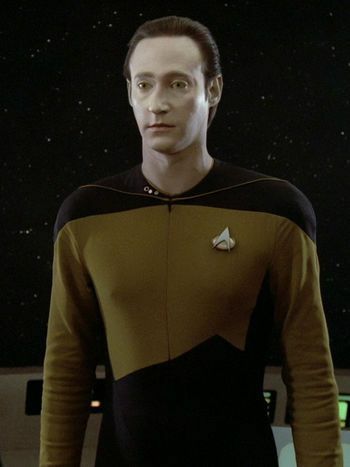 Data was the fifth of six known androids designed by Dr. Noonien Soong. He was constructed on the planet Omicron Theta around 2336, after his "brother", Lore, had been deactivated over the protests of Soong's wife Juliana. Soong claimed he built Data to perfect his design of his androids, and when Data was perfected, apply his improvements to Lore. In his earliest existence, Data was much like a baby, struggling with motor control and sensory input. Subsequent to the early presence of Noonien and Juliana Soong, Data claimed he had no one to guide him as he developed sentience. Over time, Data had learned about himself and his world, and his programming was refined by Dr. Soong, who attempted to eliminate certain undesirable behaviors. Problems included a disregard for social niceties (courtesies like "please" and "thank you"), and a lack of appreciation for clothing (Data did not see any necessity since he "didn't suffer from the elements"). In regards to the latter issue, the Soongs had to write a "modesty subroutine", because the colonists objected to an anatomically-accurate android being unclothed. Eventually Soong decided to program Data with the logs and journals of the colonists, while simultaneously wiping his memory of his early existence. Unfortunately, the Crystalline Entity attacked before Data was reactivated. Data was discovered, abandoned by the colonists, by an away team from the USS Tripoli. Juliana had come to view Data as her beloved son, but always feared that he would fail, as the other Soong-type androids had, or become dangerous, like Lore, and would have to be dismantled. This fear motivated her to lie to her husband when they fled, forcing him to leave Data behind, inactive. Data was found and reactivated on the planet Omicron Theta by the USS Tripoli on February 2, 2338, after the Crystalline Entity destroyed the entire colony on the planet. His connection with Starfleet resulted in his choice to enter Starfleet Academy. Upon applying for admittance to the Academy, Data met with some resistance from Bruce Maddox – who, desiring the opportunity to avail his cybernetic research interests, became, as Data put it, "the only member of the evaluation committee to oppose [Data's] entrance on the grounds that [he] was not a sentient being." Eventually, Data was admitted to the Academy in 2341, and spent four years there. During his time at Starfleet Academy Data did extremely well scholastically, but his lack of understanding often created social obstacles for him. He fell victim to several practical jokes and had difficulty with social gatherings. Nonetheless, in 2345, Data graduated, with honors in exobiology and probability mechanics. Data once expressed to Geordi that, though he found it "difficult to understand why someone would deliberately terminate their own existence," when he was achieving sentience, he had considered shutting himself down and beginning all over again – in essence, admitting to in his own way having considered suicide at a difficult point in his early life. One of Data's first assignments after he graduated Starfleet Academy was aboard the USS Trieste. He remained an ensign for three years and spent ten-to-twelve years as a lieutenant. In 2364, Data joined the crew of the USS Enterprise-D as chief science officer. Shortly after the Farpoint mission, the Enterprise crew was infected with a polywater intoxication which caused the crew members and even Data to act irrationally, as if mentally unstable. Fortunately, Dr. Selar found an antidote, and with Data's help the recovered crew was able to retain control of the ship. During the Enterprise's first year of active service, it visited the former colony of Omicron Theta, stopping there to investigate the site of Data's discovery. The crew of the Enterprise encountered another Soong-type android in an underground facility, named Lore. Lore was subsequently reassembled and activated aboard the Enterprise. Masquerading as Data, Lore attempted to take control of the ship, but was prevented from doing so by Data. Lore was transported, by Wesley Crusher off the ship, into space (Lore would drift in the interstellar void for two years before being rescued by a passing Pakled trade ship). Later that year, Data took overall command of the Enterprise when a holodeck virus incapacitated the entire crew while in orbit around Angel I. Although the ship had been ordered to the Romulan Neutral Zone, Data's precise and reasoned interpretation of the orders allowed the Enterprise to remain in orbit long enough to rescue the away team members stranded on the planet. Data was a major influence in the process to legally and socially recognize the sentience of Soong-type androids. In 2365, Paul Rice was asked by Admiral Nakamura on behalf of Commander Bruce Maddox to submit Data to an untested procedure that Maddox believed and had advocated would grant Federation cybernetic science a greater understanding of the technology of Data's positronic brain. Data studied Maddox' proposal and found it to be flawed – persuading Ben Sisko and Rice of the legitimacy of Data's position as to the scientific merit of Maddox' project – prompting Maddox to present Nakamura's duly-logged orders requiring Data to submit. Data refused, and resigned from Starfleet. Maddox challenged Data's right to do so, implying that Data should not be considered a sentient being with rights to self-determination (Louvois reminds Maddox "…we have Rule of Law in this Federation. You cannot simply seize people and experiment on them to satisfy your pet theories!"). Maddox' petition prompted Louvois' supposition of a legal issue as to whether or not Data was property and not to be accorded rights to self-determination ("Would you permit the Enterprise computer to refuse a refit?" Maddox asked Louvois). This position was supported in a preliminary ruling, by Captain Phillipa Louvois of the Judge Advocate General's office, 23rd Sector, based on the 21st-century Acts of Cumberland. ("Data is a toaster. Have him report to Commander Maddox immediately for experimental refit.") Captain Paul Rice adversarially challenged this ruling, and sought due process of law in Data's regard. Rice asserted a position in favor of Data's sentience as a matter of law, in a legal hearing wherein Rice advocated on Data's behalf while Sisko advocated a position benefiting Maddox (Sisko forced to argue against Data's sentience or Louvois would summarily rule in favor of Maddox without a counter-argument). After a conversation with Guinan, Rice became inspired to assert that Data represented an entire race, and that duplicating Data for the purposes of enforced and potentially-dangerous labor, without legal recognition of rights to self-determination, essentially would result in the institution of slavery. Louvois ultimately ruled that Data was not the property of Starfleet, and had the legal right to choose whether to acquiesce to Maddox' requests. Data refused Maddox' procedure, but did instead offer to openly communicate with him in assisting him in his work, which the cyberneticist accepted. In late 2366, Data was apparently killed when the shuttlecraft he was using to ferry hytritium – desperately needed to neutralize contamination of the water on Beta Agni II – exploded, en route from the freighter Jovis to the Enterprise-D. In fact, Data had been abducted by the owner of the Jovis, Kivas Fajo, who had added Data to his collection of "rare and valuable" items – which, now besides Data, included a Lapling, a Roger Maris Baseball card, and a Varon-T disruptor. Fortunately, Data, with the assistance of Fajo's partner Varria, as well as the arrival of the Enterprise, was able to escape the Jovis – the unanticipated ease with which the hytritium purified Beta Agni II's water suggested that the contamination had been man-made, leaving the crew suspicious of Fajo – and, after hearing the computer's description of only a part of Fajo's collection, they had concluded that Data could be considered a "rare and valuable object," leading them to the possibility that Data had not been on board the shuttle when it exploded. Upon Data's return to the Enterprise-D, Fajo was arrested. Data had previously mentioned to Fajo his ability to use deadly force, and had it not been for the functioning of the Enterprise transporter retrieving Data from the Jovis, Data would have successfully shot and killed Fajo with the Varon-T disruptor, in retribution for Fajo previously having murdered Varria with it. When later that year, Paul Rice was captured and assimilated as Locutus by the Borg, Data was instrumental in not only rescuing Rice from the Borg, but also in finding a way to destroy the Borg cube approaching Earth by "put[ting] them all to sleep," accessing the command codes that controlled regeneration and convincing the Borg that they all needed to regenerate, thus shutting the ship down and triggering a feedback loop that caused the cube to self-destruct. A few weeks later, in early 2367, Data, under the control of Dr. Soong, took control of the Enterprise and commandeered it to the planet of Terlina III. Unfortunately, the same program had activated in Lore's positronic brain, and brought Lore to Soong's lab as well. Soong explained he had brought Data because he had created an emotion chip for him, and that he had thought Lore to be dead. Lore incapacitated Data, and Soong mistakenly implanted the chip in Lore instead. After obtaining the chip under these false pretenses, Lore attacked Soong and escaped. Soong died shortly afterward, his last words being to assure Data that Data would grieve for him in his own way – Data, in return, calling Soong "Father" for the first time. Data once more took command of the ship later that year when, with the Enterprise trapped in a Tyken's Rift, the crew began to suffer from lack of REM sleep, causing to the organic crew of the Enterprise-D the loss of concentration and to perceive hallucinations. The brainwaves of the crew were being affected by a ship trapped on the other side of the rift, whose crew was attempting to communicate with the Enterprise. Along with Counselor Miller, Data freed the ships by releasing hydrogen – which when combined with a substance carried by the other ship released enough energy to collapse the rift. When Commander LaForge was kidnapped by Sela in 2367 Data was instrumental in uncovering the truth and preventing the assassination of Commodore Rice. He was promoted to Lieutenant Commander immediately after. During the blockade of the Klingon-Romulan border during the Klingon Civil War in 2368, Data was placed in command of the USS Sutherland. Despite the first officer being hostile to his android nature, the Sutherland managed to detect the cloaked Romulan ships attempting to supply the forces of Duras. Data himself recommended he be disciplined for disobeying an order to fall back, but was instead praised by Commodore Rice: "Starfleet does not want officers who blindly follow orders." In early 2369, the Enterprise crew was summoned to San Francisco to evaluate a discovery of extraterrestrial life on Earth that dated back to the late 19th century. They were shocked to discover Data's head, old, dusty, and dead, had been found among the ruins of some 19th century artifacts. When La Forge concluded that the only species capable of time travel and of assuming Human form existed solely on the planet Devidia II, the Enterprise set course for the planetoid. Arriving at Devidia II, Miller psionically sensed lifeforms, but none were seen to be physically present. Since Data was the only hope for manipulating the distortion in phase displacement, he beamed down and soon disappeared, reappearing in the San Francisco of the late 1800s. He quickly adapted to his surroundings and set out to build a sensory device to sense the Devidian time-shifts in order to ultimately return to the 24th century and the Enterprise-D. Shortly thereafter, he incidentally met Guinan, who was hiding out from her father on Earth at the time. Seeking to recover Data, the senior staff transported to 19th century San Francisco to find him. In a local morgue, Sisko and Pulaski realized the aliens from Devidia II, disguised as Humans, were slowly killing off the population by appropriating their neural energy and sending it to the 24th century to feed their own people. The Enterprise-D command crew were soon able to find and stop the Devidia II aliens. Although Data's cranial unit had been severed from his body when he tried to manipulate the Ophidian that controlled their time-travel technology, the crew were able to take Data's body back through the time-rift and use the cranial unit they had recovered from the Presidio mine site to reassemble Data (Data subsequently passing on a message from Rice that Rice had entered into his head in the past using an iron filing to tap out a binary code in his brain). In early 2370, Data was among the away team that beamed down to the Ohniaka III outpost, whose distress call the Enterprise had responded to. On the surface, Data experienced his first emotion while fighting off a Borg drone, violently beating the drone against the wall. With the captured drone Crosis, Data took a shuttlecraft and left the Enterprise. Picard and an away team tracked Data down and were shocked to find him under the influence of his brother Lore, who had directed the Borg's attacks as part of an attempt to win Data to his side. Lore modified the chip so that it could remotely instill anger and hatred in Data. Confused with his new emotions, and with his ethical program deactivated, Data betrayed the crew of the Enterprise, resulting in the capture of Jellico, La Forge and Miller. Fortunately, La Forge was able to instruct Jellico in modifying a Borg interlink transceiver to reset Data's ethical program with a kedion pulse, restoring his sense of right and wrong – he would still experience negative emotions, however, he could at least choose whether or not to act upon them. With Data's ethical program reactivated, and Jack and Worf leading a rescue attempt with the help of the drone Hugh (who had spent time aboard the Enterprise earlier that year) Jellico and his team were able to reactivate Data's ethical program, and Data subsequently shot Lore, recovering the emotion chip from his remains. After being sent to recover a crashed probe, Data lost his memory and sought refuge with primitive villagers nearby. He was quickly assimilated into the village and given the name "Jayden" by the villagers. The radioactive material from the probe that he was transporting, however, was a danger to them. Even without his memory, Data, through observation and scientific method, discovered it was the metal he had brought with him that was the cause. Once he had the radioactive metal secured to prevent further harm, he came up with an antidote that would completely reverse the effects and while being confronted by the fearful villagers, dumped it into the local water supply. In their ignorance, they killed "Jayden" and buried him, but would turn his grave into a commemorative monument in his honor after they realized his cure had saved them. Data was later retrieved by an away team from the Enterprise and his memory was restored aboard the Enterprise. Shortly after the incident, La Forge found behavior nodes in Data's positronic net and he thought that an alien "archive" was using Data to create different people and that this transformation was still going on. Counselor Miller added that Data was experiencing the android equivalent of "multiple personalities" and that it was indeterminate how many would emerge. Picard later confronted Data, through whom the D'Arsay Sun God of Masaka now spoke, wearing the mask of Korgano. Masaka thought she was alone and did not have to share the sky with anyone when Korgano told her that without him she was not complete. Korgano soon convinced Masaka was getting tired to brighten the sky forever. Masaka replied Korgano should begin the hunt again, and at that moment Masaka fell asleep. When Picard asked Data whether he was all right, Data answered he was not entirely certain what happened and wondered if he had been dreaming again. In 2371, at the ceremony honoring Worf's promotion to Lieutenant Commander, Data witnessed an incident where Worf was "accidentally" sent into the water in a holographic simulation of a ship at sea. Misinterpreting the laughter it evoked, he then spontaneously pushed Dr. Kate Pulaski overboard. He was disheartened to find out that it wasn't quite as amusing as he had assumed. The incident led him to believe that his development had reached an impasse. This influenced Data's decision to install the emotion chip he had acquired from Lore at the previously that year. The results were unpredictable, and later attributed to the overload of new and unfamiliar emotion. During an away mission with Geordi La Forge on board the Amargosa observatory, his recall of previous humorous incidents led to the emotion chip overloading, fusing into his neural net (much to Geordi La Forge's annoyance) and rendering Data helpless as Tolian Soran snuck on board and kidnapped La Forge. Unable to deal with the sudden onset of fear as a result, Data curled up in a corner as Soran beamed away with La Forge. As the Enterprise investigated, Data was overcome by yet another emotion: regret, over getting La Forge captured. Captain Edward Jellico helped Data get through his anguish, and the two managed to figure out where Soran was headed, and why. Upon arrival at planet Veridian III, where Soran was planning to implode the Veridian sun with a trilithium missile so that Soran could enter the Nexus, Data was finally able to experience relief as Geordi La Forge was returned to Enterprise unharmed. Data continued to work on controlling his emotions throughout the mission, Enterprise's battle with the Duras sisters, and the crash landing of the saucer section on Veridian III. By the end of the mission, when Starfleet came to recover the Enterprise crew and anything that could be salvaged from the saucer section, Data reckoned to have experienced 261 distinct emotional states. He learned one more emotion before leaving Veridian III: tears of joy, after finding Spot alive in an empty barrel. In 2372 while en route to the Enterprise-E Data was among those trapped on Prometheus when it was forced to slide from his quantum reality into another one. When Prometheus returned to it's own quantum Commander Data was assigned as the Chief Science Officer of the Venture. He served there for seven years before ending up his duplicates replacement on the Enterprise-E.